What was of Norman Stone Castles ? What did Norman Norman Stone Castles look like - the Architecture - the purpose? What type of stone was used to build castles? William the Conqueror employed a strategy of building a network of Norman Stone Castles. Permanent, dominating castles to augment the wooden Motte and Bailey castles. The wooden castles with the problem of their destruction by fire made wood unsuitable material for permanent fortification. Stone was the next chosen medieval castle material of the Norman era (although timber was still used for doors, roofs, frames and scaffolds). King Edward I and his chief architect and builder Master James of St George followed the Norman strategy of building even more stone castles and introduced the famous and massive Concentric Castles. Converting wooden castles to stone castles! Many of the initial wooden constructions of the Motte and Bailey Castles were strongly fortified by converting them to stone castles. The first development and fortification was to raise the timber buildings on stone walls and once this was complete to entirely re-build the Castle Keep (tower) in stone. Thus emerged the first Stone Castles of the Medieval Era - including, of course, the famous Tower of London. William the Conqueror's chief stone castle architect and builder was called Robert, Lord of Belleme. Mortar consists of bonding materials which are used in masonry, surfacing, and plastering that hardens in place and is used to bind together bricks or stones. The mortar used to bind together the stones when constructing medieval castles was made of water, sand, and lime mixed together. Between the Battle of Hastings and the Norman Invasion in 1066 and the date that William the Conqueror died in 1087 a total of 86 stone castles had been built! Eighty-six castles in just 21 years! It is believed that as many as 1000 wooden Medieval Motte and Bailey castles were built in England. Attacking Norman Stone Castles - Weapons, Siege Engines and Mining! During the early Middle Ages, double-edged swords, axes, spears, short bows and the battle-axe were the weapons generally used. The crossbow was then introduced. The crossbow was lethal - it could pierce armour and 3 bolts could be released in a minute! But attacking a Norman Stone Castle also required siege warfare. 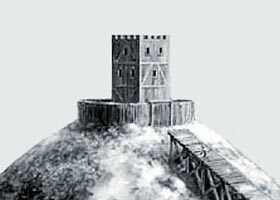 Huge siege engines had to be used when attacking stone built castles. These massive siege engines pounded the thick masonry walls with stone missiles or huge arrows. There were different types of siege engines which included the ballista, the mangonel, and the trebuchet which were used when attacking stone castles. Other weapons such as the battering ram were also used to bring down the stone castles. Attacking Norman stone Castles also required mining! Tunnels were mined leading to a weak part of the stone castle (usually the corners of a building - which led to the development of round stone castles and keeps ). The tunnels were propped with timber props. The tunnels were then packed with brushwood. A torch was put to the brushwood and the fire would cause the corner of the stone castle to collapse! It now becomes clear that Moats were introduced to hamper the work of the miners! The Norman Stone Castles were built well with high towers and strong building materials. The architecture included such defensive features as the loop holes, murder holes, portcullis, crenellations and machicolations. Whether the Norman Stone Castles could withstand a siege depended on whether there was there enough food and a good supply of fresh water. The Normans were the victors - the invaders of the English Anglo Saxons. Life for the Normans was good. Their successful invasion of England meant wealth for the Norman invaders. Lands were divided between Norman Lords and they built the Norman Stone Castles . Life in the Norman Medieval Castles depended on the rank of the people who inhabited the castle. The Lord of the Castle and possibly his family would live in the most protected part of the castle - the stone Tower or the Keep. Servants would be expected to provide food for the Nobles and soldiers. Other occupations within the castle were the blacksmiths - to keep a supply of arrowheads and bolts, the Stable hands to help with the horses and the kitchen staff. Many Norman churches were built at the same time as the great stone castles. The rectangular or square style of the keeps were mirrored in the design of the rectangular Church tower. Many of these churches served a dual purpose. The church was used as a safe haven against attack in the absence of a local stone castle - they were the strongest buildings in every area. The doors of the churches were fortified. Villagers from surrounding areas would retreat to the huge stone church whenever their community was threatened. The Norman Stone Castles survive today. The architecture of the Norman Stone Castles and Churches still dominate much of the British landscape. But time moved on, weapons changed and castle building improved to meet the requirements of new weapon technology. The Norman era moved on to the English history of the Plantagenets especially the stone Welsh Medieval Castles and the Concentric Stone Castles built by the ambitious Plantagenet - King Edward I. What was the purpose of Motte and Bailey Castles? What did Motte and Bailey Castles look like?